We’ve written many articles on the move toward a “cashless society.” These articles describe how liberal academics such as Ken Rogoff and Larry Summers have campaigned for the elimination of cash and its replacement by 100% digital payments systems. This is part of a thinly veiled agenda to monitor all financial transactions, impose negative interest rates and readily freeze bank accounts in the next financial crisis. 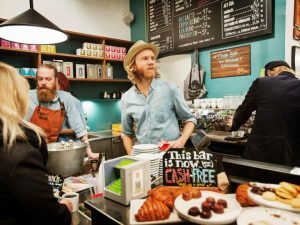 A lot of the focus has been on Sweden because it has gone further than any other country in the direction of a cashless economy. The alternative to cash has included credit cards, debit cards, Apple Pay, Venmo and other all-digital payments systems. Even the most advanced of these systems requires some kind of device such as a smartphone or chipped card to pay for items. As shown in this article, Sweden has now gone the last mile by allowing citizens to have microchips implanted in their bodies. These microchips have what’s called near-field radio identification that links to a bank account or other payment sources and also links to the vendor’s payment system. When you want to buy a cup of coffee, you simply wave your hand near the coffee shop scanner and your coffee is paid for. This sounds convenient, but is actually nefarious. If an implanted chip can pay for your coffee, it can also be used to track your whereabouts 24/7 and create a complete log of all transactions at all times. In a more extreme crisis, the government will be able to locate you and round you up easily. The same is true if you’re carrying an iPhone, but you can always throw your iPhone into a river and keep moving, free of surveillance. That’s not so easy when the “iPhone” is implanted in your body. When people trade freedom for convenience, freedom is always the loser.